It’s so easy to get taken in by the fancy new cupboards, worktops and flooring when designing your new kitchen, however lighting is something which is often overlooked. The lighting can totally change the look, feel and usability of a kitchen. Many people will simply leave the general ceiling light in place and not bother with any additional lighting in the room. By just spending a little bit of time and money researching the different types of lighting available for your kitchen it is easy to add an extra touch of luxury to the space. There are several types of different lighting for the kitchen area which we will now look at individually. This will normally be the main light or lights in the room, providing most of the light that is required for general use. Highlight lighting is generally more decorative than functional, often used to highlight kitchen appliances or decorative features. These are normally spot lights, however strips of LED lights are becoming more and more popular as they are more energy efficient and easy to hide under the edge of cabinets. Task lighting is pretty much the opposite of highlight lighting. Rather than being used for decorative purposes, it is used to provide much needed light in areas while you are working. For example, this could be recessed lights in a cooker hood to provide extra light while you are cooking, or lighting under wall mounted cabinets to provide extra lighting while you are preparing good. Obviously as well as the different types of lighting, each one has various different styles of fixtures and fittings available. For example, you could choose a single pendant light for the general lighting, a cluster of spot lights or perhaps a fluorescent tube light. Even within each of those types, there are literally hundreds of different styles of light fittings. Finally, the light bulbs that you use will affect the result of the lighting as well as the cost of the lighting. For example, new energy efficient LED light bulbs have an extremely long life span and will outlast many normal filament light bulbs while only costing a fraction of the price to run, however they are usually not as bright as some of the alternative types of lighting available. The color of the light from the bulb will also change the feel of the room. For example a bulb which gives off a bright white light may create a clean and fresh appearance, while a yellow light may tinge the room and give it a different appearance. 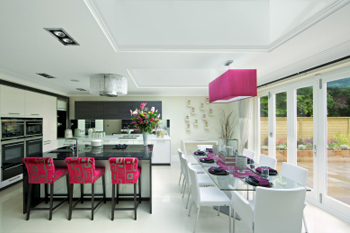 The author has been designing bespoke kitchens for many years, for both commercial and residential use. Having recently taken up a position as a designer for kitchens manufacturer VelaCici, he is now concentrating purely on replacement kitchens for the home, as well as replacement kitchen worktops.